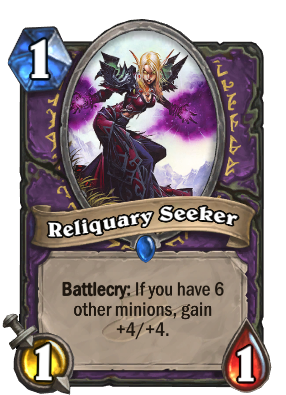 Battlecry: If you have 6 other minions, gain +4/+4. The Reliquary considers itself the equal of the League of Explorers. The League of Explorers doesn't. So this card was mocked as worthless, found to have amazing value, but now withoutImp-losion andHaunted Creeper may fade into obscurity again. GG Brode, releasing cards which require cards you're soon about to axe to be useful.Dark Peddler andImp Gang Boss will have to work overtime. She really doesn't, since you cant play her after ritual unless you coin. Her laugh is really cute though. This card basically acts as a third and fourth giant in my version of Zalae's hobgoblin flood. I forgot to screenshot but onetime I got the ultimate 13/13 with two Hobgoblin and Brann Bronzebeard. I tossed a couple of these in my Zoolock and they're not as hard to activate as people seem to think. There are lots of times I managed to drop a 4-drop and this (As a 5/5) on turn 5 or 6. Sure, sometimes it ends up just being a 1/1, but overall I think it has some potential. For those who say it's a "win more" card, I don't think a board of small tokens will win the game itself. I dislike the art of this card. It looks like it's been stripped from a bigger picture and overall doesn't highlight the character in it well. It is, they re-used a TCG card art. I honestly thought that this card is a complete trash, but it works pretty well in zoo (playing reynad's zoo atm). Played several games and not even once I had problem activating it. This proves once again that you can't predict the future of the card. So Reynad is streaming a deck with two of these for about 10 hours and having great success with it. So now I expect every Zoo deck to run these because that's how online games community work. Another aspect of this card, is not the inclusion of it to Warlock deck, but another situational card that increase the power of Dark Peddler. As taking this card while you have some minion on Board and Implosion in hand give you a 5/5 for that 1 mana which is usually awkward to curve out. But playing this to ruin my curve and stuff? No. Coupled with cards like Imp-losion and Imp Gang Boss, or evenDreadsteed combo decks this can be a great cheap combo to the battlefield. If you have a strong board already, Brann Bronzebeard can turn this card into a devastating 9/9 for 4 mana. Most important, if you have a strong board, it's a 5 mana 5 damage clear withShadowflame. Imp Gang Boss, Implosion, Haunted Creeper and the everlasting Dreadsteed makes this card valuable. See Giant dies to BGH, she does not. The requierement shoulf be 4 or more, because as we all know you cant fill the board because you run out of options. It has no fit in handlock or even zoolock since it takes a spot for the normal imps. I like the card for the art and the concept, better than Sea Giant but harder to play. But you run to the same problem: filling the board with no silence to counter any combo removal AT ALL.